Today is Chinese New Year (well, New Years eve actually). I am not sure how much of a celebration there will be in Phuket since the country is still officially observing a 100 day mourning period for Princess Galyani Vadhana who died age 84 on January 2nd. Large celebrations are not encouraged, and indeed the "Old Phuket" festival which was planned for later this month has already been cancelled. I might go and have a look around the Chinese Shrine in Kathu later (if I am still awake), see if anything is happening. For sure there will be plenty of firecrackers at midnight! 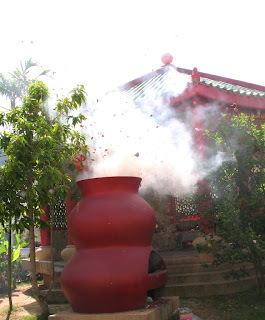 We've had a morning of firecrackers already at the little shrine in Karon Plaza. The weather is warm and sunny, sky is blue, but there is quite a strong wind gusting which cools things a little and means the sea is a bit bouncy. Today is also the 50th anniversary of the Munich Air crash that killed 23 people including players and staff of the Manchester United football team known as the "Busby Babes". Manager Matt Busby only just survived the crash. Eight of his young team were among those who died in 1958.